This story began early in April and was first shared, in part, on the "Looking Closely Collaboration" project blog. It took a while to revisit the inquiry unfolding here because it involved not just me and my students, but also an integral player who was a part of our class two days each week: "Daniel days" as we came to know them in room 109. I have invited Daniel to add any comments or aha's here as well, when he is fully finished his exams and adjusted to his status as newly-graduated ECE. The story below is taken verbatim from the original "Looking Closely" post, followed by an update from the next week when we revisited the provocation and documentation with the afternoon class. Since writing that post I finished a book I'd been reading on and off for a month, one I'd bought at a wonderful "February Flurry" Early Years Conference at Mohawk College in Hamilton. The author Susan Stacey was both the keynote speaker and the host of my first session of the day. Her stories resonated deeply with me that day and her book was no different. 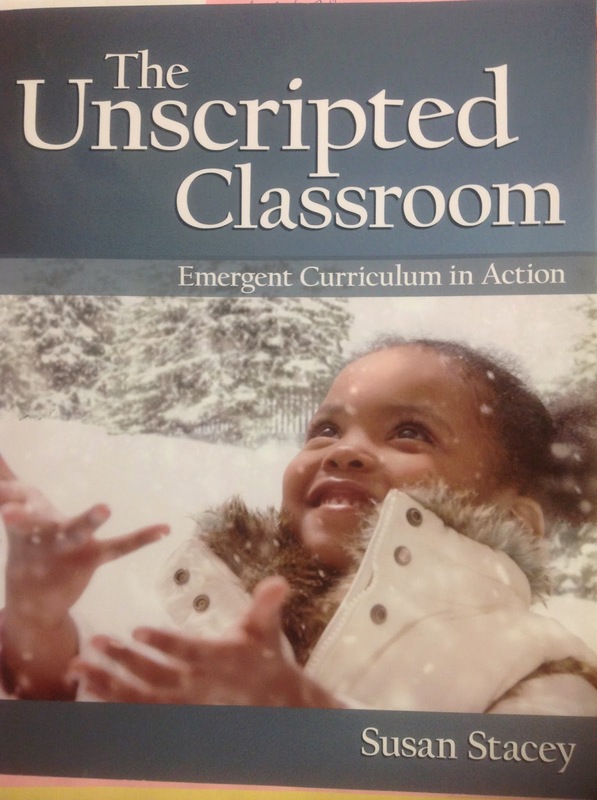 What happened was that I saw my experiences, both positive and negative, clearly framed in the chapters of "the Unscripted Classroom". I could see where I had given up on an idea too soon, or where I could have supported students to solve a problem I rushed in to solve. I also saw that I had learned and grown from my early inquiry days, so that the inquiry detailed below felt like another turning point in my practice. Each chapter begins with a meaningful quote. The quotes pictured below both seemed to capture the delicate balance of a teacher in an emergent curriculum classroom, one I try to maintain daily. This profound quote sums up the learning journey of the teacher better than anything I'd seen or heard before. We have been so fortunate as a class to have our ECE candidate Daniel Kerr (@DthedudeK) join us twice weekly. He is a natural teacher in an early years room: curious, patient, calm but enthusiastic, immediately engaged in the play of any group he joins. I have adored watching how quickly the students adopted him as their own; indeed the day his professor came to visit us she wasn’t immediately able to find him upon entering the room, so immersed were we all in our various inquiries throughout the busy classroom. I worry sometimes that guests entering this noisy, joyful place might see chaos, but she was delighted to have children come tell her about their play explorations, and eventually find Daniel deep in discussion with several students in the light centre. He adeptly takes anecdotal notes (on our ever-present clipboards) or documents learning on the fly (with the class iPad) including involving the learners in creating pic collage stories to share on our class twitter. A big idea I hope to impart (whether to parents, special guests, or valuable long-term additions like ECE or teacher candidates) is that the direction of the learning is always negotiated with the learners in the room. This means continually changing plans, adapting centres or materials to support new directions, and letting go of ideas we adults have when the students come up with better ones. It is the change to my own teaching practice that has had more impact than any other, including removing “must-do” activities from our daily schedule, relaxing rules about how many may use a centre, area, or toy, indeed even how furniture is used. Another way to say it: I have actively tried to stop saying “no” to ideas, even those that sound implausible. Once students know the basic rules of the room (we expect respect for learners and learning environment) they are able make many choices each day (during our ‘play and learn time’) without hearing the words “no” or “stop”. So it is I bring up the story of water music. A few months ago I brought out the provocation pictured at right during our weeks-long celebration of Chinese New Year. It’s a simple set I had at home: a small china teapot (lid not pictured here) with five china cups, a metal tray, and a dozen or so chopsticks. This was quickly a favourite place to pour, chime, splash, tap a rhythm, and refill the teapot from the sink. I also shared a musical provocation in the form of a short video of a beautiful piece of music performed entirely on clay pots and china. The performance became the soundtrack to our play and learn time for weeks as students simply clicked “replay” every time the music stopped. Daniel and I both noticed wonderful connections being made by the students to water: how it dances (when the water-filled tray is played like a cymbal), how the pitch changes depending on the amount of water added to each teacup, eventually how to lower pitch by adding water (that discovery made me dance with glee because it was worth the wait for students to discover what we adults knew but didn’t want to teach), how much water could be added before the green tray overflowed. A while ago I dug out some water glasses I had bought over the summer, expecting someday to use them to make a water-glass xylophone like the ones I had seen on Pinterest and in friends’ classroom photos on twitter. They had been languishing in my cupboard because too many good things were always happening in the room already: interesting artifacts gathered on walks entered play, or toys from home, or created toys such as the hand-built “beyblade” spinners. Daniel was looking for materials for his next provocation, and somehow the idea of the musical glasses came up. I gave him the set of 6, still boxed, and shared an image I’d seen of colourful water glasses along with markers and paper to record musical ideas. He made up plans for how to introduce it the following week when he returned to our class. A rainbow of colours by our rainbow of paper. Next step: to introduce to the class. Daniel sets the scene. Doesn’t that look inviting? Let the music begin! Now this is where it got interesting. A few years ago I might have considered what happened next to be a failure: a failure to explain the task or game, a failure to follow instructions. Now, I see it rather differently. I was surprised, and also a bit disappointed, when the sound of tinkling water glasses (so lovely!) was soon replaced by the sounds of water sloshing into glasses, and children saying; “ooh” and “ahh” at the spectacle of new colours appearing in front of them. Hmmm. Where was this going? 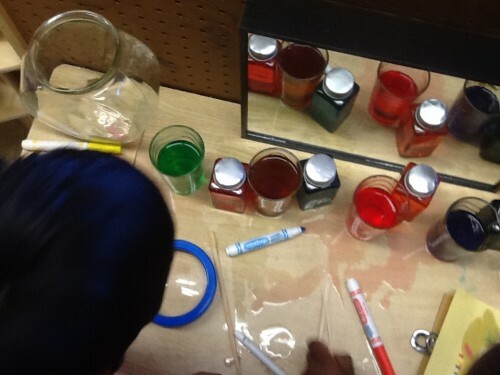 Our “potions” (the clear jars mixed up a few weeks back in a colour-mixing experiment) were quickly brought over to join the glasses, and the order rearranged to play with new ideas. Note the clipboard where Daniel had begun to demonstrate ideas to record a tune. Photo by Daniel. See here how pouring is becoming the focus of the activity, with colour mixing and quantity both holding interest for the various students who come and go. 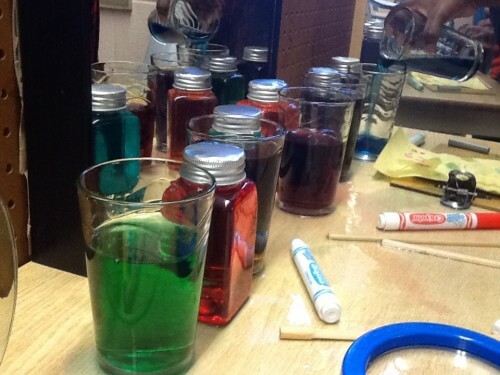 Markers are used to compare to the “potions” and to inspire new mixes. Photo by Daniel. Now much of this rich talk is being captured by Daniel. Another ongoing inquiry has developed into a line exploration collaborative poster and I am there, capturing the talk and taking pictures. I was engrossed for a while and completely missed the spark that turned a musical invitation into a colour exploration. This is what is wonderful in a classroom of engaged learners: once students follow their interests and have developed the social and emotional (self-regulation) skills to direct their learning, I am able to flit from area to area or sit down and join in the fun. September isn’t like this, but spring is wonderful! Even our line collaboration becomes a celebration of colour. I stay a while before visiting the other area that’s abuzz with excitement. Here a girl takes a picture of the array she has made with a friend. I love how she captures both the subjects and their reflections. Photo by A. Now the pouring began in earnest: “Ooh, look what happens when we add these two colours together!”, “It’s dark like this one (potion jar)”, “What is this, brown?” See also how the chopsticks (intended as drumsticks or mallets to play music) have all become stirrers, and the clipboards for drawing out ideas have been forgotten. 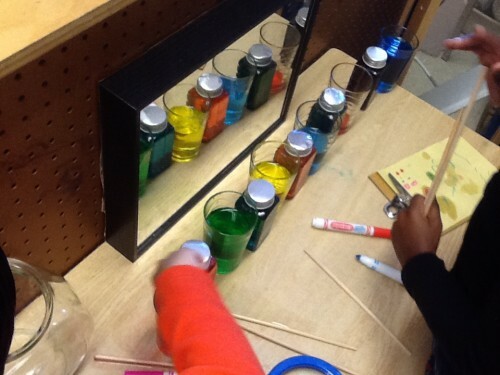 Magnifiers are brought to look closely at the mixtures in the jars and glasses. It is now beginning to get rather messy here, and materials are getting wet. Some students are concerned about the spills, while others are too focused on their inquiry to take time to notice the water. When I come over to investigate, I am torn between continuing the mixing and cleaning up the water that has now spilled onto the floor and is getting quite close to the building area carpet. After talking to the students at the table, we agree that this table isn’t quite perfect for pouring experiments because our spills are not contained. We clean up for home and plan to improve our area tomorrow for more exploring. Photo by Daniel. The next morning is mostly spent outdoors, and reflecting on how much time was needed the day before to really explore this invitation, we reserved the water music for another day. When the PM class returned, we gave the water music idea another try. After consulting with the students who had experienced the messy spills, we came up with the improvement you see below: use a tray! We kept the mirror behind the glasses, and I added the stirring drum, again wondering if this might suggest musical exploration. 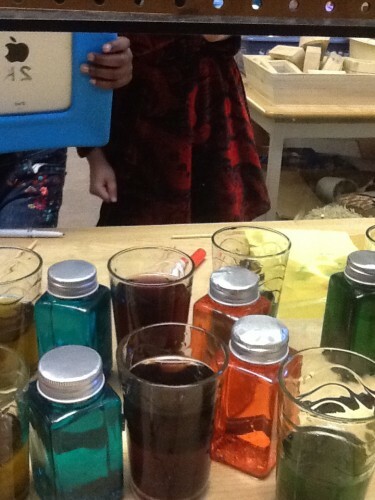 You may notice from the image below that there is music happening (one girl is striking the glasses with the mallet) but also something new… today we started with clear water, but the colour idea was too strong so students came up with this (brilliant!) solution: add markers and stir. I didn’t want to say: “no” but was stuck by the thought that markers might never be safe in our class again. Our compromise: we tested all of our markers! The new ones with bright colour were recapped and left for art. 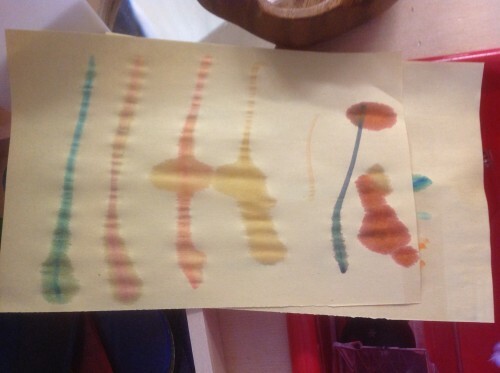 The dried-out markers were all brought here to test. This included sorting, comparing, negotiating (“This one’s red, we don’t have any other red”, “How about brown?”). 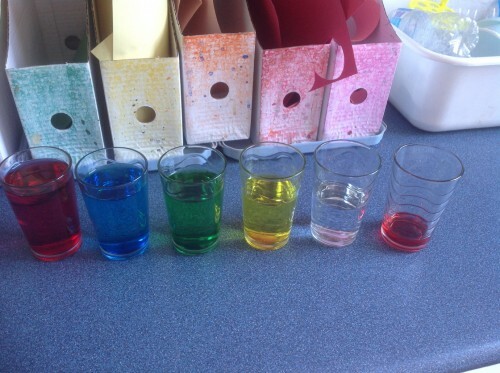 New potions are created, with surprising results as the colours darken over time. Here S happily transitioned from making music to testing the new colours achieved by adding the dry markers to the water. We all agreed that the new colours were beautiful and not just like the original marker they had come from. Interesting! The delightful result of following a student inquiry. Saying “yes” really does help us get to know how creative and capable our students are. (note: click on the speaker icon for sound: I've set it to silent due to the distracting noise that occurs when embedded vines play non-stop. Click again to silence). The next clip is from the second day, when the students requested both a tray to contain spills, and markers for rehabilitating. I resisted following up on the interesting developments on Wednesday, instead enjoying beautiful outdoor exploring weather and focusing on a few of the other ongoing inquiries each day. 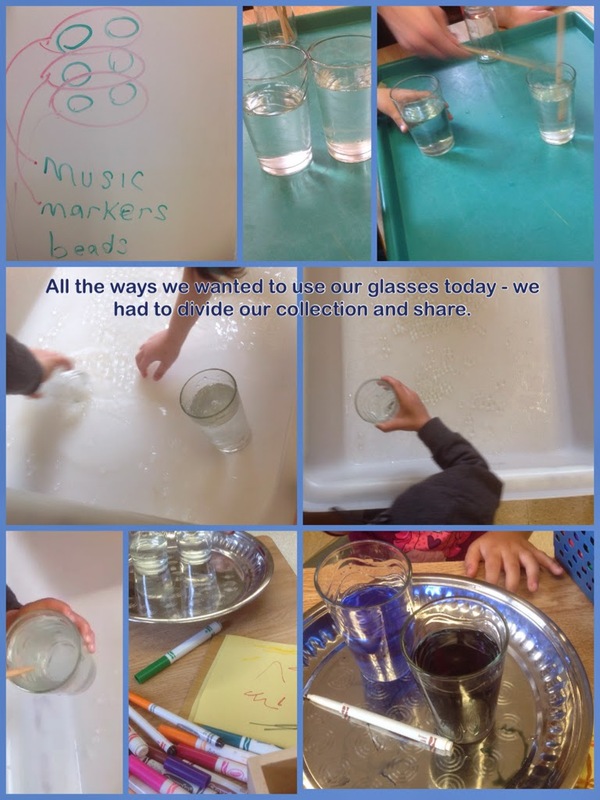 In our planning for the following week, Daniel and I discussed revisiting the musical glasses through pictures and documentation. We decided that even though the morning class had taken interest in the artifacts and experiments left out overnight, it was the afternoon group who had taken ownership of the project and thus it was their class we would bring the discussion to. We showed several images (simply scrolling through the original blog post and our class tweets) and talked about how we had planned for music but that we liked how the students were following their own plan so well. Then we brought up that this time we could come up with an idea together, using the materials we already had to whatever use most wanted. This was an interesting process! Here are as many of the ideas as I was able to capture during our meeting time at the carpet. 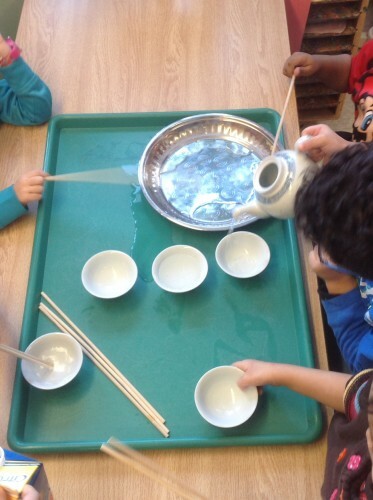 C: We had to pour the water to make the sounds. A: I know, let's do it again. Ms. Fynes: What will it sound like? Z: The big red one will be deeper. (The red glass is fullest, and least full is reddish too). D: No the little one will be deeper. J: We spilled it on the floor. 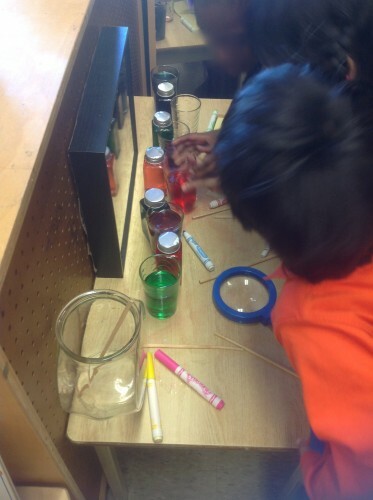 J: It was mixing: blue and green and red and yellow. J: Oh! There's a lot of colours. S: You put the tray there so if it spilled it didn't go all over. S: We put them in water and tried it. Z: It looked like paint! The lines are bigger. S: The small marker makes small lines. J: The big ones made a big line. C: They made a splash. R: First we put water in and then we add the markers. 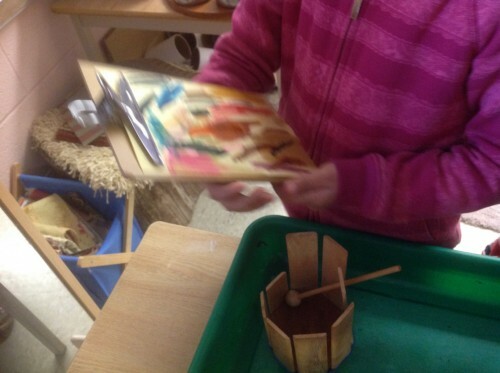 Next, after looking at the photos and discussing, we asked the students what they would like to do today, if given the same materials: 6 glasses, water, colour, sticks, trays, and whatever other materials or tools they wished to explore. 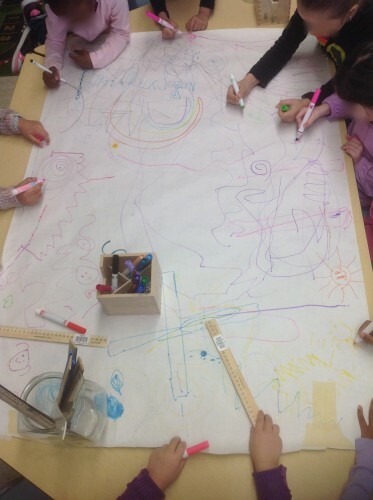 S: We could use water, music, and colour. Ms. Fynes: I'm not sure I understand what you mean! S: First we could make music. 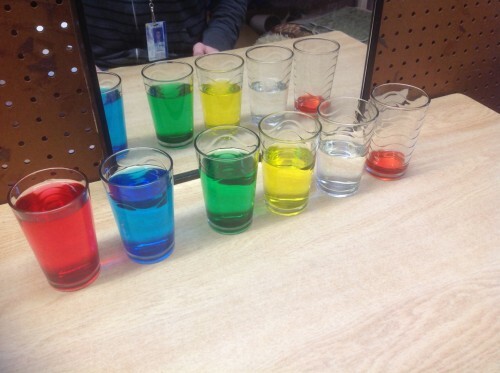 Then we could pour water, then we could use colour. (several students objects to this, wanting to use for one or the other right away). Daniel: Should we split the cups? J: I want to do the markers. C & S: We used the "dead" markers (referring to those markers that had dried out). A: I want to use water beads. 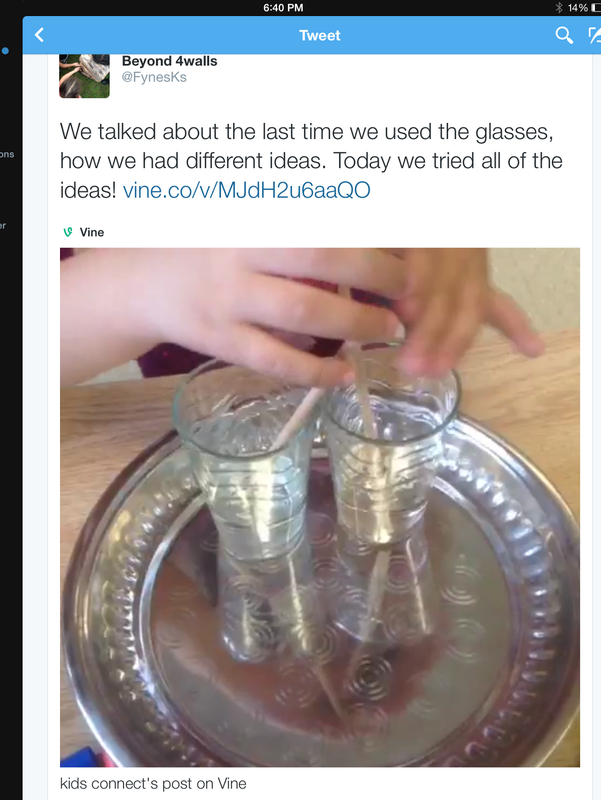 Ms. Fynes: Water beads in the glasses? Where would you use them? A: In the water table! That's where the water beads are, right? To help move the conversation along, as we'd been at carpet longer than usual and because I wanted to help every voice be heard, I drew all six cups on the white board. At this point I put my clipboard down so I don't have a record of what was said, however it took a few moments of growing frustration among students before "N" came up and started circling the cups I'd drawn, dividing them up to give two cups each to three different groups Daniel had recorded: music, markers, water beads. We were set! N helped us divide the glass cups evenly between three centres. 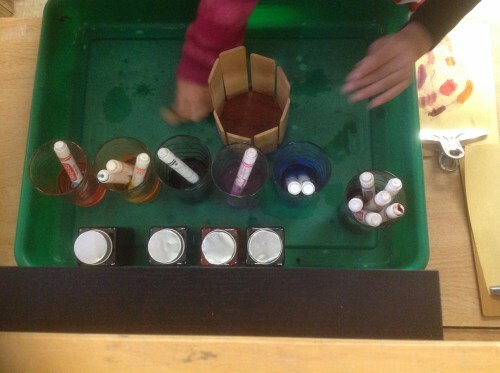 Students congregated where they wished to play: water beads in the water table, testing markers on a tray at the writing table, making music and pouring water on another tray. What I learned on this day was that it wasn't necessarily important that the eventual play didn't last as long as we had envisioned (in fact two groups left for snack and moved on to a balance inquiry project elsewhere in the room), but that revisiting the pictures and talking about what went right and "wrong" the first time (students identified the spills as something to avoid, something wrong) was valuable even for those students who hadn't participated in the explorations on one or both of the days the week before. Students were able to assess the photos, ask pertinent questions, and identify possible problems, simply by looking at what their classmates had done. Another valuable take-away for me was simply the power of students self-documenting their inquiries. I have joined Suzanne Axelsson's "Through the eyes of the child" project this spring and I'll soon be reflecting with the students which of their photos capture the story they want to tell to an international audience. Though we haven't yet chosen our photos, using this lens has made me aware of the importance of looking at the photos we share, on twitter and in the room.